Cisco-Eagle: Robotics seem to be a more common addition for materials handling applications compared to, say, 10 years ago. Smaller operations and more diverse company types seem open to automating various processes. Why is that? Wes: As robotics becomes more popular in general, it increases the awareness and further educates potential end users of the capabilities. When people who run these types of distribution and manufacturing operations learn about the latest capabilities of today’s software and hardware for intelligent robotics along with increasingly competitive pricing, they realize that robotic automation makes a lot of sense. Cisco-Eagle: You mention competitive pricing. When talking about ROI with a customer, what are the key points that make a difference in the robotics decision-making process? Wes: When considering ROI, it is also important to remember TCO (total cost of ownership). Customers must understand how much a system will cost to operate and maintain, not simply its purchase price. Robotics keep operation and maintenance costs down. 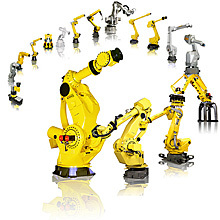 FANUC offers power regeneration which actually puts regenerative breaking power back into the customer’s power grid. The controllers also have a standby mode that saves power when the robot is in idle state. Maintenance costs are kept low due to the high reliability and MTBF (Mean Time Between Failures) of robots. Robotic solutions also typically require a lot fewer components. Cisco-Eagle: So return on investment is greatly improved over past years. What factors indicate it may be time to add robotics to an operation? What specific issues should facility managers be on the lookout for? Wes: Any simple repetitive operation that takes more than one person, or is done for multiple shifts make great candidates. Other indicators to consider robotics are high maintenance cost of existing equipment, and trouble finding a labor force. Robotic solutions solve both of these issues for facility managers. Cisco-Eagle: Can you describe some applications that you have seen or implemented that could help people understand the way robotics could improve their operations in unexpected or unconventional ways? Broadly, how are people applying the technology in ways they were not, say, 10 years ago? Wes: In the past, a lot of packaging applications were done conventionally since robotics was behind on speed, software, and vision capabilities. Today this is the opposite. Robots are replacing most of the conventional hard automated machines in applications such as case packing and palletizing. Robotic technology is compact, efficient, and reliable. Cisco-Eagle: People say that robotics puts people out of work. How do you respond to that notion? Wes: Robots are generally an operator’s and operation manager’s friend. Typical operators have to do multiple tasks that they are constantly juggling. 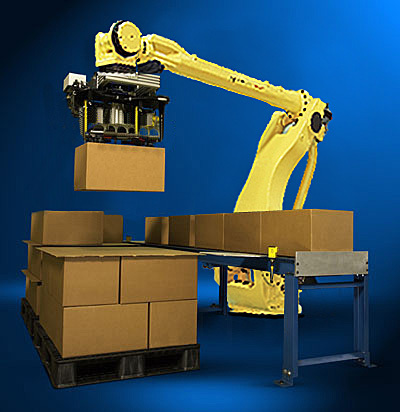 Robotics handle the most repetitive tasks like packing or palletizing products. The operator becomes a robot tech who can better manage production orders and higher skill level tasks without all the repetitious motion. In other cases, it also allows companies to grow by having more labor force free to work on new product lines being developed that initially have lower production rates. Cisco-Eagle: Many are familiar with the use of robotics in the automotive industry, but where are robots finding the greatest use in material handling, distribution and warehousing? What applications are they best suited to? Wes: The easiest task is palletizing since it is at the end of the line. Palletizers are easy to find a home for, and cases/bagged products are relatively simple to pick up and palletize. Picking and packing can be a little more difficult due to higher rates and product types that need to be picked. FANUC offers a powerful Picking/Packing software called iRPickTool that simplifies the applications. When it comes to distribution and warehousing, robots work well for palletizing/depalletizing, along with order fulfillment. FANUC’s 3D Area Scanner allows for robot picking from bins, totes, and rainbow pallets with ease. Cisco-Eagle: With that said, what are the most notable changes/improvements in robotics in the last 5 years that have helped move them further into the Material Handling realm? Wes: The advancements in machine vision, 3D area scanning, and force sensing have greatly improved robotic capabilities. These intelligent products allow robotic applications to continue to expand greatly. Cisco-Eagle: Are you seeing robotics utilized in the energy sector? In what ways? Wes: Yes, robots are being utilized in the energy sector. The primary use is for batteries. Everything from recreational vehicle batteries to hybrid and electric cars are demanding the greatest use of robotics in the energy sector for assembling and packaging. Cisco-Eagle: That’s very interesting. Can you explain how robotics is making the workplace safer? Wes: Robots make the work place safer by doing the worst, repetitive work. Robots also resolve all of the ergonomic issues that operators currently struggle with today. Cisco-Eagle: What trends are you seeing for changes/improvements in the next 5 years? What new technologies excite you most? Wes: The improvements in the speed of robots along with 3D area scanning technology are very powerful. Robotics with 3D area scanning technology will be able to be highly utilized in warehousing order fulfillment to keep up with the continuous increase in ecommerce demand. Robots will also continue to be more sanitary friendly for food applications. Cisco-Eagle: That provides some interesting possibilities for improvements in material handling applications. We greatly appreciate you taking time to visit with us. Any last thoughts? Wes: Automation, including robotics, CNC and factory automation is providing the tools necessary for manufacturers in the Americas to stay competitive and profitable. Whether large or small, we encourage companies to investigate the benefits provided by automation.